ICE! at the Gaylord Palms is an annual walk-through attraction during the Christmas holidays at the Gaylord Palms Resort that is made completely of ice. Imagine taking a simple ice sculpture that you might see at a wedding or special event and then building out that sculpture out into several rooms of colors and ice to it. Add in an ice slide and that is what you get with ICE! The 2018 edition of the attraction features A Christmas Story (the 1983 beloved holiday movie), ice slides, and a traditional nativity scene. Located just outside Disney property, across Interstate-4, the Gaylord Palms Resort brings in 40 ice artisans to spend more than 30 days to hand carve out 5,000 blocks of ice that weigh close to 2 million pounds. For the last several years, characters from the Dreamworks animated movies of Shrek and Madagascar have been featured along with classic Christmas characters and images and a nativity. The all-new theme featuring the classic holiday movie, A Christmas Story, brings this hilarious family tale to life through interactive ice sculptures and displays. Experience iconic scenes such as The Old Man’s Major Award, Aunt Clara’s pink nightmare and the ultimate triple dog dare at the school’s flagpole. Everything is hand-carved from two million pounds of ice. Along with A Christmas Story are Santa Claus with his reindeer, and Christmas Trees. Several of the rooms features lights that are contained within the ice that blink and light up and the attraction ends with a nativity made of crystal clear ice. 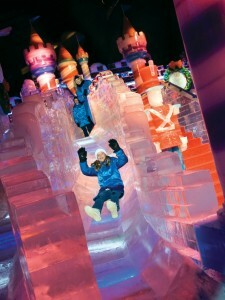 The ice is colored in many of the rooms to bring the characters to life and a slide is a popular part of the attraction where guests can slide down a clear slide made of ice that is surrounded by popular world icons such as the Sphinx, Eiffel Tower, and the Statue of Liberty (see video below). ICE! will be taking place from November 16th, 2018 through January 6th, 2019 with hours that vary throughout the months. Click here to visit the official site of ICE! for more information (including peak and non-peak days) and to purchase tickets. Click here for our guide on spending Christmas at the Gaylord Palms Resort and click here for all things to do around Orlando during the Christmas season. This entry was posted in Attractions and tagged annual events, christmas, december, gaylord palms, holidays, hotels, new years eve, november. Bookmark the permalink.